If you’re new to the world of ultrarunning and endurance racing, there’s something big and important that you might not think too much about, until you find yourself on a single-track trail with a dim headlamp stumbling over loose rocks and fearing for the health of your ankles: running at night is hard. 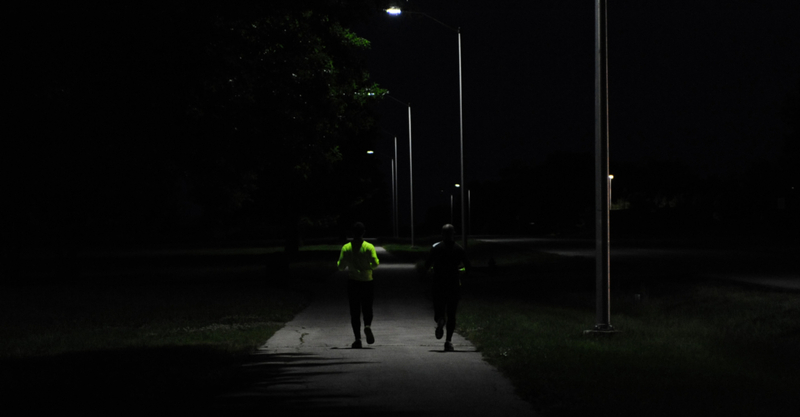 For most races under 8 hours long, running in the black of night isn’t something you need to worry about. Once your event or race gets to be 8+ hours, thinking about and experiencing night running has to be part of your training. Here are some quick tips on how to make the most out of it during training. Assume no one can see you. That means you need to move out of the way for everyone. Most night running will occur on roads, sidewalks, and neighborhoods. Even at night, there is traffic that can hit you. If you’re running on the road (recommended over a sidewalk to avoid tripping and annoying sloping driveways), run on the LEFT side of the road if you’re in a country that drives on the right. That means that you’ll be staring straight into headlamps of oncoming traffic so you can see the car before they see you. If you run on the right, you’re trusting that they can see you and will move around you. Don’t trust drivers at night. The only situation where I recommend running on a sidewalk is when the speed limit is greater than 35mph and the sidewalk is nice and easy. If you find yourself running on a 50mph road without a sidewalk, you chose the wrong route. Turn around and find another way home. Another important situation is if you’re coming up to a crossing of the road and a car pulls up and stops at the intersection. Cross the road BEHIND the car, even if it means changing your running path. At all times, assume that the driver can start moving or turn their car towards you without turning on their blinker because they can’t see you. Lights & reflective clothing are your friends. Night running isn’t stylish. You should wear a headlamp and/or carry a flashlight, as well as wear clothing that reflects light both on your front and back. If you’re worried about how you look, imagine that you’re in the 1980’s and construction vests are popular again. The reflective clothing in the front and the back is to assist traffic in seeing you a long way off. Even though you’re assuming they never see you (see above), it’s helpful when they actually do have a chance at seeing you and can give you the appropriate space. Personally, I like wearing a reflective wrist or ankle band. That can be seen from many directions, isn’t as cumbersome as a full vest, and moves when I’m running, so the car can figure out that I’m a human running around at night instead of a walker, biker, or golf cart. The headlamp and/or flashlight are both for you and the traffic that you’ll inevitably encounter. Psychologically, you will run slower if you can’t see in front of you. It’s a natural protection mechanism. So, if you have a bright headlamp that mimics the light of day, you will run faster. We all like running faster. The caveat to that is if you have trained yourself to run in low or no light by running in those conditions often, your body will learn to be less fearful and therefore run fast with reckless abandon. The reason why I say headlamp and/or flashlight is that a single light source can play tricks on you. For anyone that’s run on a rocky trail with a bright headlamp, you know that it’s very hard to see divots and rocks because the single light source flattens the texture of the image you’re looking at. A second light source (flashlight) allows for your mind to use binocular vision and see the 3D texture by causing shadows and other variations. If you’re training for an obstacle race where you’ll probably need both your hands, I’d recommend leaving the flashlight at home and getting used to how surfaces look with just a headlamp. I believe in experiencing every aspect of your race during your training. That means you’ll want to get used to running in the same light that you’ll race in. I advise experimenting with your gear and lighting conditions at least a few (>=3) times before race day. In addition to training through all times of day that you’ll be racing in (day, sunrise, sunset, dusk, night), think about the phase and brightness of the moon. Some race directors are especially kind to you and schedule the race for the weekend closest to the full moon so you might not even need a headlamp. In that case, you absolutely should schedule your night runs 4 and 8 weeks before your race so that you get to see how running by moonlight works. It’s pretty awesome, in my opinion. Other race directors, however, can either be mean to you and select a night with a new moon (pitch black) or ignore the moon phase when scheduling the race. Especially if you’re running close to a new moon, you’re going to rely on your light sources a lot more, so you’ll need to learn the practicalities of using your specific gear. In terms of which light source to use, I prefer a bright headlamp. As an obstacle course racer, I usually do events where I need the use of both my hands and I don’t want to bother putting a flashlight in and out of my backpack. The challenge to using a headlamp is affixing it tight enough so that it doesn’t bounce incessantly while not causing a headache or rash. My trick is wearing a baseball hat backwards so the headlamp rests on the lining of the hat and not my forehead. That tends to avoid the very stylish pressure mark that can form when you strap the headlamp to raw skin.